Close your eyes and imagine that you are deep in the sea. It is dark and cold, and you hear the sound of whales coming from miles away. You complete me. You took me on a trip to all of the oceans, introducing me to wild places like the Seychelles Islands which are made of granite. I met your wild friends, such as the Bathykorus Bouilloni or as you lovingly called it, the Darth Vader jellyfish since it has the helmet look of the bad man from space. You had me at the detailed diagram on page 41 that shows the layers of the ocean. In the Midnight Zone, you told me that only the female anglerfish has the lighted lure on its head and beard to go with it. Why use a razor to shave when you have razor sharp teeth? I felt a wave of emotion in Chapter 3 as you explained how waves work and the powerful energy that they contain. I learned about Mont-Saint-Michel, which is an island off the coast of France. Or is it? Depends on the tides as they go back and forth, covering and exposing a land bridge that connects the island to the coast. Show me the ocean!! And you did, with beautiful photographs and diagrams that explain what goes on underneath. Continents shifting and tsunamis blitzing. A mountain range that is almost nine times longer than the above ground Andes Mountains of South America. Around twenty thousand underwater volcanoes exist, but we are just learning about many of them so that number will increase. Our journey finishes with brave explorers combing the depths of the ocean and other scientists who are fighting to keep our seas in good shape. You leave with good advice about how I can care for our saltwater superstars. Thank you for taking me around the seven seas and back again. Up and down the Atlantic coast, between Virginia to Rhode Island, engineers are looking for places to build offshore wind farms – just like the wind farms that provide energy for other parts of the country. But the Atlantic coast is a migration corridor for millions of birds – birds that play an essential role in the ocean food chain. 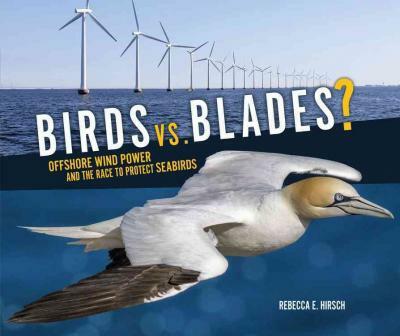 So the question arises: can we harvest clean wind energy without harming seabirds? Red-throated loons and Surf scoters seem to avoid areas where wind farms are located – making habitat loss a concern. The gannets fly at the same height as turbine blades, so they may be at risk of collisions. And doing the research isn’t easy – and it involves a team of people, from the capture team to wildlife veterinarians, to a host of other scientists. Hirsch not only follows the field adventures of scientists, but also the journeys of one of the tagged gannets. Complementing informative – and fun to read – text are plenty of photos, maps, diagrams, and lots of sidebars that help expand the story. “Protecting the ocean is a big job,” Hirsch writes. It’s too big for scientists and politicians alone. “You can take action in your own home and community to help.” She ends with things everyone can do. There’s a handy index, source notes, and a glossary. 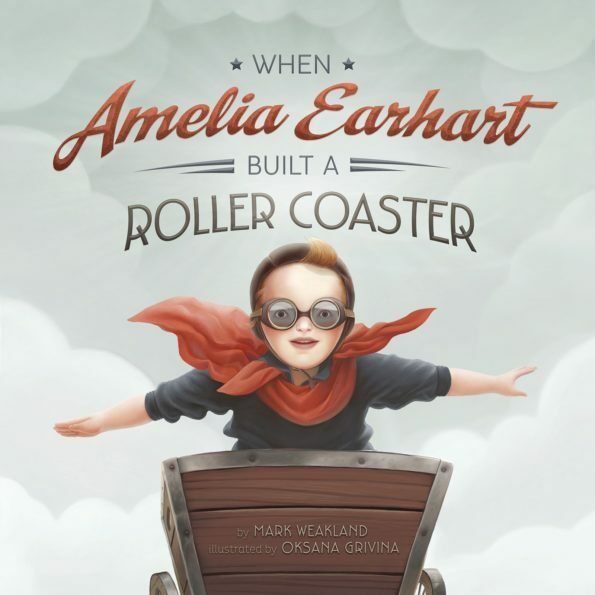 Booktalk: Amelia Earhart was one of America’s most famous aviators. But do you know what she was like as a child? From running on the river bluffs and playing football to building a roller coaster, Amelia Earhart was an active and confident child. Snippet: Amelia loved mechanical things. Her most famous creation was a roller coaster. The track was made of boards greased with lard. The car was an empty wooden crate. Because of an acorn, a tree. Because of a tree, a bird. I love the ecological layers in this book: food, shelter, seed, transport. Everything – everything – is connected. I love the illustrations. Simple, soft, just enough detail. And cumulative. Plus there are some interesting die-cuts where the shape created the image on one page, but the coloring is from something different on the next. See what I mean? Seedling and grass roots and soil particles… how cool is that! I love the back matter. That’s where you can learn more about the white oak tree – a “foundation species”, and what an ecosystem is, and what role saplings play in the food chain. That’s where you get the nitty-gritty details about forest inhabitants and why we need forests. And that’s where you’ll find four things you can do to help forests. 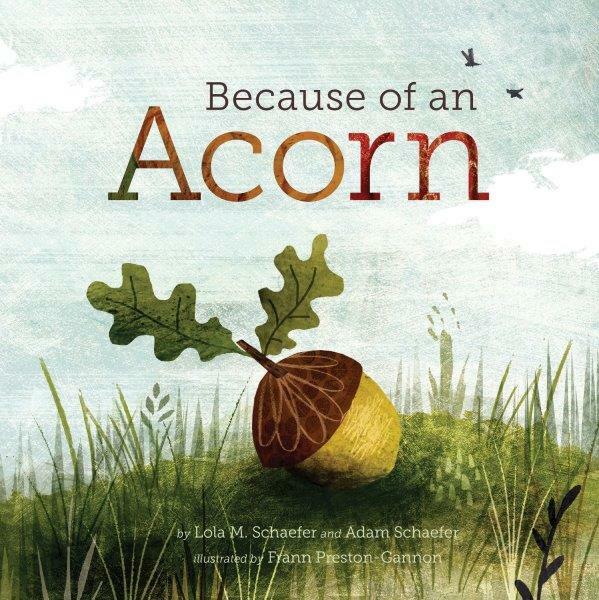 By this time in November, most of our acorns are gone – eaten by turkeys or buried by squirrels. But I know that I’ll find tiny oak sprouts in the spring… in my gardens and in the middle of the yard. And there’s always plenty of acorn caps to use for art projects. 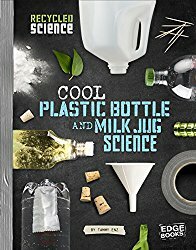 Today we are featuring a middle grade title Cool Plastic Bottle and Milk Jug Science (Recycled Science) by Tammy Enz. Tammy Enz has come up with nine intriguing science activities that reuse plastic containers. It’s a win-win scenario because plastic containers provide inexpensive containers for science projects, and finding new purposes for water bottles or milk jugs keeps them out of the landfill. The instructions for the activities are short and clear. There’s a list of materials you’ll need, step-by-step instructions how to put it together, photographs showing the set up, and a brief explanation of what’s happening. Activities range from making a cloud in a bottle in a few minutes to a longer term composting worm farm. Cool Plastic Bottle and Milk Jug Science is perfect for a busy educator who needs a science activity fast. The best part is the materials are inexpensive and generally readily available. If you are doing science with kids, it’s a great book to have on hand. If you are looking for activities to accompany the book, stop by Growing With Science blog. Categories: STEM Friday round-up | Tags: Cool Plastic Bottle and Milk Jug Science, plastic milk jug science activities | Permalink. Squirrels wrestle. / Squirrels leap. / Squirrels climb. /Squirrels sleep. 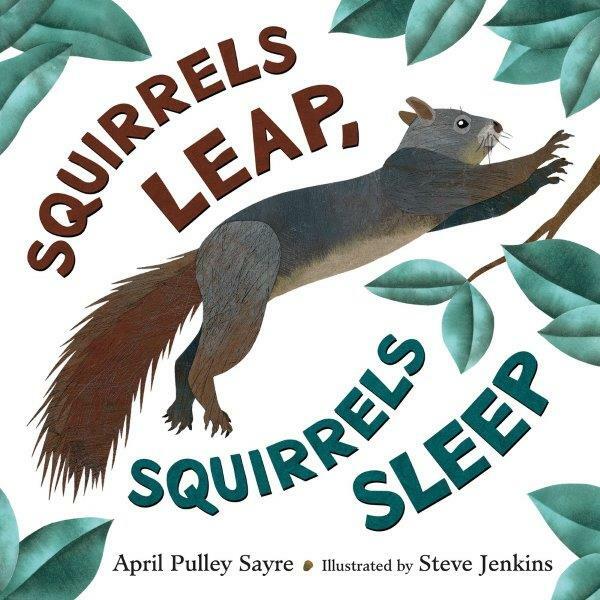 Active, rhyming text takes readers through a day in the life of a squirrel – from climbing branches to storing seeds … to flying. We meet four kinds of squirrels native to North America who demonstrate the things squirrels do. For example, squirrels use their tails as an umbrella and to help for balance. What I like LOVE about this book: Sayre’s spare text leaves plenty of room for Jenkins’s wonderfully detailed cut-paper collages. The illustrations will have kids pausing before page-turns just do they can take a closer look at a squirrel running up a tree with a mouth full of leaves. What are those leaves for? 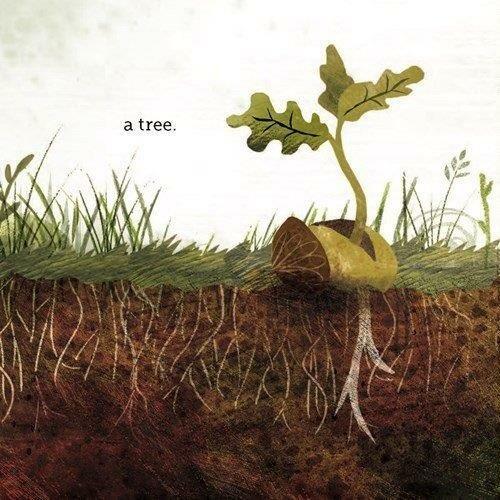 There are buried acorns that germinate into oak seedlings, and a groundhog – what’s he doing in the picture? There’s back matter! Four pages of luscious extra details about the squirrel species, what they eat, the kinds of nests they make, and how they (unintentionally) help plant trees. Pulley includes scads of resources and some notes for kids who want to dig deeper into squirrel science and environmental issues. Head over to Archimedes Notebook for some squirrely beyond-the-book fun. Booktalk: Can you smell with your feet? Do you dig your claws into a river’s muddy bank to climb up and bask in the sun? Animals legs are different from humans in so many ways! 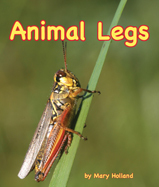 Find out why strong talons suit a raptor, or webbing is perfect for water dwellers as author Mary Holland continues her photographic Animal Anatomy and Adaptations series by exploring the ways insects, amphibians, reptiles and mammals make their way in the world. 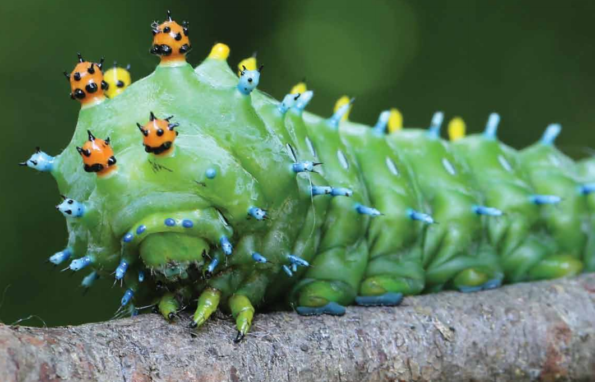 Caterpillars may look like they have lots of legs, but only the first three pairs are true legs. The others are called prolegs.